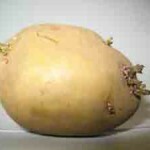 Most potatoes naturally produce one main chit (sprout). This is apical dominance. end of the tuber, & it supresses the sprouting of other eyes. Is it better to plant a potato with one main chit, or lots of chits? One main chit will produce fewer larger tubers. For early potatoes, this will bring an earlier harvest. Knocking off the main chit, desprouting, may result in more stems and smaller tubers, because apical dominance is eliminated. Cutting tubers into pieces breaks apical dominance between eyes, releasing eyes to sprout. Seed planted in light, sandy soil which warms rapidly tend to produce more stems and set more tubers & result in smaller harvested tubers. Later planting tends to produce more stems per plant and have a lower yield. Sprouting of tubers under light produces short, tough green sprouts. earlier maturation – as much as 2 weeks. Chit for early harvested yield. warm seed to 50-60degrees F for a few days before planting & plant in slightly cooler soil. Don’t try to use potatoes from the vegetable section of the supermarket because they may be diseased, and they probably have been sprayed with a chemical to inhibit sprouting.